Bryan graduated from Plymouth State College in 1998 with a degree in Physical Education/Athletic Training. His calling to ministry on the campus came as student. Motivated to see people live in health and wholeness, he knew education and medicine alone would not suffice. His dream is to see students empowered and equipped to live in tune with God, bringing Gods kingdom life into every part of our culture and world. The Bessette’s are now with the US Missions Department of Church Planter + Developers. This designation brings together our unique ministry roles and allows them to serve the campus while also building stronger collaborations with the local churches, non-profits and community groups. 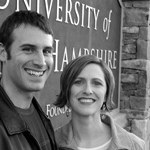 Please pray for the Bessette’s: for our families health, for wisdom in parenting, maintaining a God honoring and life-giving schedule, and directing the ministry at UNH.